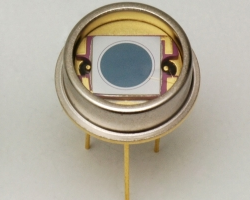 HAMAMATSU has developed various types of Si detectors that offer enhanced near-infrared sensitivity due to a MEMS structure formed on the back side of the photodiode. The S11499-01 is a family of Si PIN photodiodes with drastically improved sensitivity in the near infrared region at wavelengths longer than 900 nm. Compared to our conventional product, the S11499-01 has much higher sensitivity to YAG laser light (1.06 um). It also offers improved temperature characteristics of sensitivity at wavelengths longer than 950 nm.